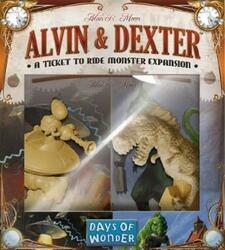 This is Alvin and Dexter, two terrifying creatures who are overturning the train train of your parts of Ticket to Ride! Represented by miniatures, Alvin the Alien and Dexter the Dinosaur bring a crazy touch to the game - but you'll have to adapt your strategy to prevent your opponents from building their train lines and remove points at the end of the game! Be careful this game is an extension of Les Aventuriers du Rail: Allemagne ... + 4 more+ 4 more and cannot be played alone. To be able to play it you must have a copy of the game Les Aventuriers du Rail: Allemagne ... + 4 more+ 4 more.